Oxygen levels at the 13,796-foot summit of Mauna Kea, which houses the W.M. 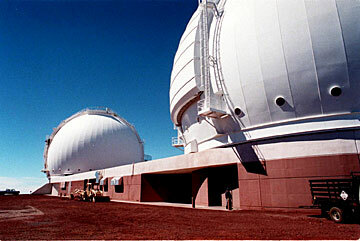 Keck Observatory, are only 60 percent of those at sea level. Workers have reported feeling run down. KAILUA-KONA, Hawaii » The W.M. Keck Observatory on the Big Island has become the first observatory in the world to offer oxygen to its employees so they do not feel tired working in high altitudes. A $25,000 grant from the M.R. and Evelyn Hudson Foundation has allowed the observatory atop Mauna Kea volcano to provide oxygen to its workers through portable "HELiOS" units. Oxygen levels at the 13,796-foot summit are only 60 percent of those at sea level. Some workers have noticed that the limited oxygen has impaired their mental abilities and caused them to make more mathematical errors, feel fatigued and lose attention. "We were hearing complaints from employees. Some claimed to be so worn out, while others thought they were experiencing job burnout," observatory spokeswoman Laura Kraft said. Facilities Engineer Craig Nance said he often felt tired and winded before the additional oxygen was available. "I was miserable, tired, worn out and had a headache," said Nance, who used the portable oxygen unit last week. "I couldn't do anything, including taking my telescope out to look at the stars. ... This makes me feel human." Acute mountain sickness tends to affect 75 percent of people in elevations above 10,000 feet. About half of the observatory's workers are now using the units, which weigh about 5 pounds and can be worn around the waist or with a shoulder strap. They deliver oxygen through tubes placed inside the nostrils. Some, however, say they feel fine and do not need the devices. "It's a 100 percent macho thing for me," said Rick Johnston, a construction manager. "My crew and I are always crawling in and out of shutters. The units are too cumbersome, too awkward." But Johnston still believes the units will do good for those affected by the oxygen-thin air. "It's like they just took a couple of shots of whiskey," he said. "They've lost that spark in their eyes."